Spotify is great service that enables us to stream the right music anywhere we go. When we are outside, we can listen to Spotify on our iPhone, Android mobile phones, tablets, smart watches or car stereo systems. And when we are home, nothing is better than lying on the comfortable couch and browse the favorite tunes, playlists from the smart TV. You can use the Google Cast, AirPlay, Spotify on Playstation or Android TV. The last one seems the easiest since Android TV and the set-top box is so popular and the Spotify app is available on Android TV. Furthermore, it is free, you don't have to have the Spotify premium to use it. For more tips, please read the full tutorial below to find out how does it work. 1. You can make best use of your smart TV's big screen and your home sound system's 5.1. Dolby stereo sound system. 2. Save the the cellular data fee by using WiFi instead of your mobile network. 3. Share the songs with your friends or family members in the same hall easily. 4. You can enjoy more features such as voice search, Google assistant and so on. The official Android TV application has hit the Google Play Store. You can install it to any compatible devices such as Sony BRAVIA, Mi Box S, NVIDIA SHIELD, Sharp AQUOS. 1. Power on your Android TV, you will see the main screen. 2. Scroll down to the Apps row and then select and launch Google Play store. 3. User the search bar or browse the Music & Audio category to locate Spotify app. 4. Login with the Spotify account and password or PIN. On the Android TV device, you can control the music playback with a connected Mouse, wireless control or Spotify Connect. I would highly recommend you to use the Spotify Connect feature. With it, you can transform your mobile, tablet or desktop into a remote control. 1. Make sure your device is connected to the same WiFi network. 2. Open Spotify to play a song and tap the "Devices Available" icon. 3. Then you can select the TV to start listening. Every settings you done from your device will show on the Spotify Android TV app. With the Spotify Android TV app, you can play Spotify songs no matter if you have a free account or a premium subscription. The difference is that premium users will enjoy higher music quality and remove any commercial ads. If you are a heavy user of Spotify, you surely don't want to hear the annoying ads. So is there a way to remove ads from Spotify without paying for the premium? Absolutely. 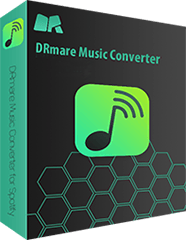 DRmare Spotify to Android TV Converter for Windows/Mac is here to help. 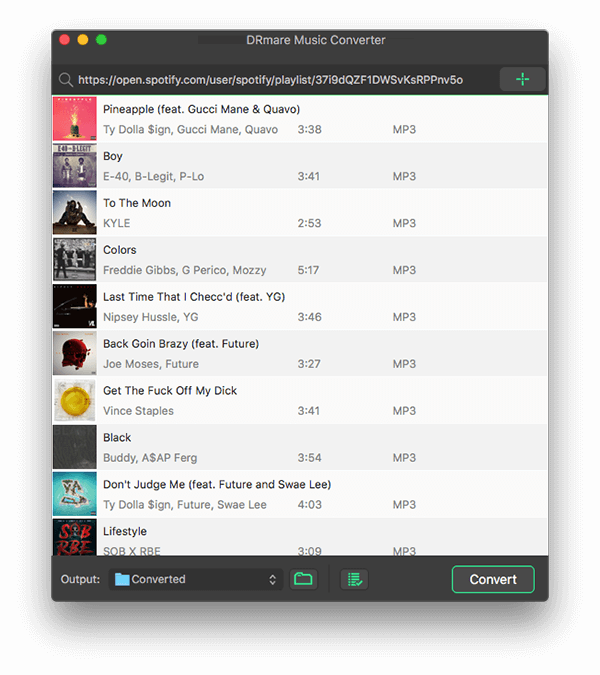 It supports to extract Spotify songs from Internet to your local devices within a few taps. After that, you won't see any popups during playback. Though the market doesn't lack similar Spotify converters, it is hard to not choose this one for its easy usability and high performance. To make it even more easier, we'd highly recommend you prepared the playlists of the your favorite Spotify tunes. And you can go ahead to download them to Android TV within 4 steps. 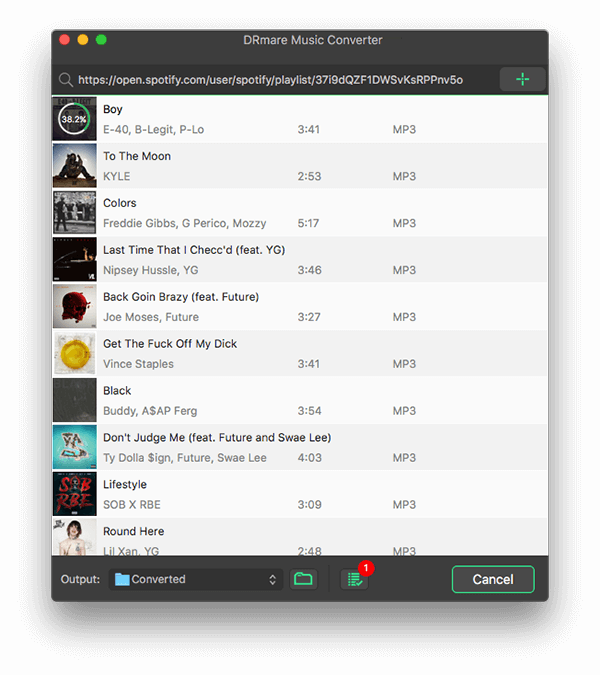 Launch DRmare software, you will see the Spotify app opens simultaneously. Please simply throw the playlists you want from Spotify to DRmare software main screen. 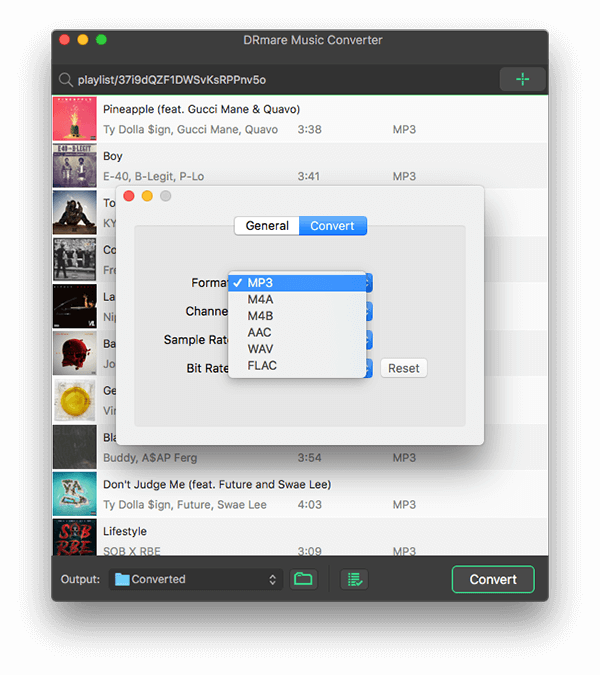 The default output format is MP3. If you'd like to get another specific format for your Android TV, you can click the top menu and choose "Preferences" to open the settings window. From there, you can adjust the output profile and parameters such as channel, sample rate, bit rate. When everything is ready, please click “Convert" button, your songs will be downloaded offline. Please don't do anything else on the computer during converting. Else it may affect the converting. Note: If you are using the free account, the downloaded songs may contain ads sometimes. But don't worry, you may just go ahead to reconvert the songs as the ads only happen occasionally. 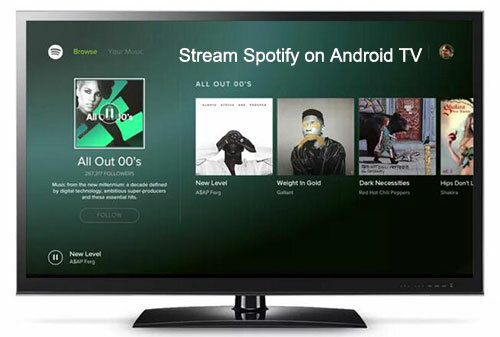 Now you can play the Spotify songs on your Android TV. Just copy and paste them to a flash drive and then you can insert the flash drive into the USB port of your Android smart TV or set-top box and then use the built-in player to browse the music for playback.